"Terrific fruit salsa mix. Be sure to seed the tomatoes, otherwise it will be too watery. There is never anything left of this...it seems to appeal to all tastes." Mix red onion, cantaloupe, watermelon, tomato, jalapeno pepper, lime juice, and cilantro in a large bowl; season with salt and black pepper. Refrigerate at least 4 hours before serving. 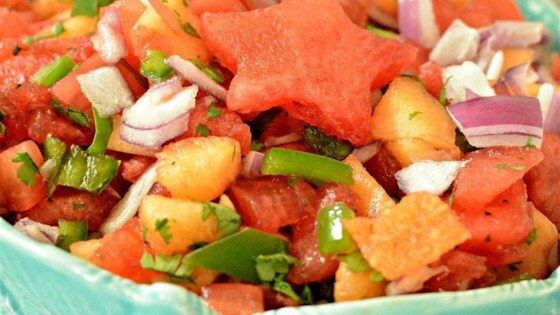 A delicious, refreshing and colorful summertime salsa. This can easily be doubled because it goes quick. I absolutely love this as is. great recipe, I subbed cantaloupe with pineapple. delicious!! !